It is easy to distinguish these two theories. Under your alternative theory we should see, prior to the policy change, many marriages that take place when husband is close to death. The size of the spike in Petra’s Figure 1 tells us many marriages would be induced by imminent death, so your story predicts that marriage is truly a harbinger of doom. Petra’s explanation does not imply this. My money is on Petra’s story. I retract the comment above. By playing with the beliefs about the probability of death over time and the match quality (how far it falls short of wedding-worthy) it is possible to generate a wide range of dynamics. Jeff’s theory involves couples who all plan to be married eventually, while Petra’s theory involves couples who are unsure whether they’ll decide to be married. Thus it is only Petra’s theory suggests a significant expansion of the set of couples who ultimately get married. 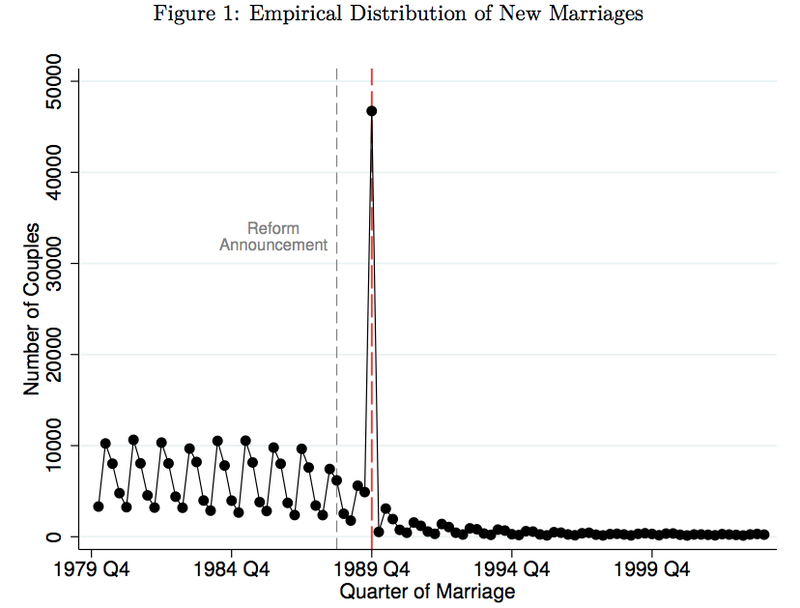 Using pre-1988 data, estimate how many marriages would occur between 1988 and today if the marriage insurance policy hadn’t been discontinued. If Petra’s theory is correct, this estimate should be lower than the actual number of marriages that occurred over that period, because some uncertain couples would ultimately decide against marriage. If Jeff’s theory is correct, then the estimate should be close to the actual number of marriages, because his story involves couples that had already decided to marry at some point in the future. the alternative theory also generates “extra” marriages. as i wrote above some of these marriages would not have happened without the reform either because he dies early or because he finds someone else to marry. Boo! Why are you not making a list this year? Also, I think you should do posts like this for other papers besides job-market papers (e.g., I think I would learn from you describing “Veiling” http://bit.ly/Lt42ZJ in words). I don’t have enough information to make a list this year. The paper looks interesting, I will take a look.